�Service-learning achieves the goal of improving student learning by linking the practical experience of community service with the subject of an academic course,� (Lott et al., 1997, p. 40). �Service-learning provides structured time for reflection and opportunities to use newly acquired skills outside the classroom. It enhances what is taught in schools by extending learning beyond the classroom,� (National and Community Service Act of 1990, p. 1). quarter came to an end." Community based learning occurs when students, the professor, service-learning class coordinator, and the community partner develop a reciprocal relationship. It takes active participation on everyone�s part to create a successful community-based project. 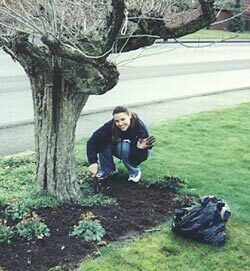 In my years in the Department of Communication at Western Washington University, I have integrated service-learning into four courses: Organizational Communication, Diversity in Organizational Communication, Professional Communication, and Small Group Processes. I would like to discuss the impact of integrating community-based learning into two of these courses: Professional Communication and Small Group Processes. Sharing this approach in these classes will provide examples of different ways to integrate the community into the classroom. What is the purpose of community-based learning in the classroom? After several years of teaching, reflecting, and assessing my courses, I decided that students needed a new interactive medium to apply concepts learned in the course. I wanted my course content to come alive, be real, and to have students think about the class after the quarter came to an end. I explored the options for service-learning on Western�s campus during my first quarter at the University. In designing service-learning course projects, students and community partners teach and learn from one another. As a professor, I continuously encourage daily reflection of learned material and community experiences through collaborative in-class discussions. Service-learning is utilized in all aspects of the course; it is not treated as a separate entity. My overall purpose was to provide students with the opportunity to apply course concepts and theories to their community based service-learning experiences, and to bring their newly acquired knowledge back to the classroom. Why is community-based learning important? By bringing the community into my classroom, students are challenged to explore current issues faced by non-profit organizations in the Bellingham community. 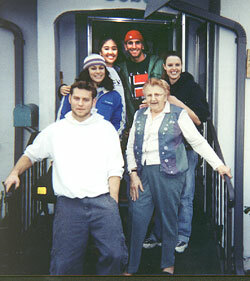 Students are exposed to diverse groups and cultures within the community. Such groups may include the elderly, people with disabilities, lesbians, gays, bisexuals, transgendered individuals, at risk youths, and children. Students are given hands-on experience by directly serving the members of the community. They use communication concepts and skills such as, problem solving, teamwork, decision-making, observation, and consideration of cultural diversity. It is my number one goal to ensure that all students clearly understand each concept before I proceed with new material. For this reason, I have designed a safe environment for students and myself to communicate, make mistakes, express diverse opinions, and much more. When students graduate from Western Washington University, they are able to apply their community experiences to future career and life aspirations. "I have always believed that the smallest act of kindness can be the greatest thing in the world. By helping others throughout this quarter, I have found a greater peace within myself. I never put muself in a situation where I get to practice this belief on such a scale and it opened my eyes. This change most reflected itself in an event that happened days ago. After my friend was hurt, I had to take him to the ER. As we waited in the waiting room, I could see all the misery and pain reflected in the people around me. I hate hospitals for this reason. Beneath the white sterility lies suffering, but instead of recoiling from it, I thought, I should volunteer here. " To see what more students have to say about service-learning, see student quotations. My teaching style is nontraditional in that the student voice is highly valued. I carefully listen and actively encourage all students to share their thoughts and opinions. I facilitate discussions and clarify theories along with providing examples. With a class of about 25 students, this type of interaction is essential. My instructional strategies include the use of videos, guest presenters, lectures, class discussions, service-learning, and student presentations. I continuously challenge the students by asking them to reflect on reading materials, personal experience, and service-learning experience. Students are required to participate throughout the course and are asked to bring a comment or question to share. Daily discussion leaders present sections of the chapter that most interest them as well as demonstrate how the assigned reading relates to their service-learning project. It is evident that my students take responsibility for their learning by being prepared and ready to participate in the discussion. Course exams often ask students to define concepts and provide examples based on service-learning or individual life experiences. I bring more than �book learning� to the course, by including personal stories and real life situations that are not mentioned in the text. Professional Communication is a skill-based course that teaches students how to effectively communicate in the workplace. Throughout the quarter students are required to apply every chapter, article, and lecture to their class experience and community based learning project. Students acquire knowledge in job interviewing, cultural diversity, small group problem solving, decision-making, teamwork, class discussions, and professional organizational speaking. During class, students are challenged to present the professional skills through collaborative discourse, impromptu speeches, mock interviews, constructive feedback, progress reports, and presentations. We often arrange our seats in a circle, which allows all members to face each other, listen attentively, observe verbal and nonverbal communication, and most of all to be connected with each other. Upon completion of the course, students should have acquired the needed professional communication skills to present themselves in an interview, work with diverse groups, be active team players, and most of all, be effective professionals in the workplace. Gain the knowledge and opportunity to apply human communication principals to a diverse professional setting such as a service-learning organization. Demonstrate understanding of theory and competence in listening, interviewing, agenda setting, problem solving, teamwork, and working with diverse groups in and out of class. Utilize professional communication skills to assist community partners to acquire communication skills to complete a service-learning project. Deliver professional oral and written presentations for the business settings. Develop a professional workshop that will be utilized by an organization. Students are asked to walk into the service-learning agency with an open mind and to share their team�s expectations, and the class goals, concepts, and theories. They are required to spend a minimum of 10 hours working with the agency contact(s) to present an interactive professional communication skills workshop. Students provide service to the community partner by developing the workshop from beginning to end, and the community partner provides the students with the opportunity to combine hands-on professional experience with academic learning. Learn about the agencies mission, vision, organizational structural chart, and culture of the organization. Observe communication styles, flow of communication, and communication issues. Provide clear communication between the student, community partner, the professor, and Center for Service-Learning Coordinator regarding deadlines, goals, and daily concerns. Demonstrate professionalism and persistence as a team. Develop a useful professional product that can be utilized by the agency. At the beginning of the quarter students begin to develop a partnership with community agencies. Students integrate learning course concepts with the community project in order to present a cohesive professional workshop by the end of the quarter. Skill based workshop topics include: basics of business and professional communication, personal skills (nonverbal/verbal/listening/interpersonal), job interviewing, working in groups, and making effective presentations. Students can either design one two-hour workshop or two one-hour workshops. Small Group Processes is a course that explores the dynamics of human interaction and diversity in small group settings. Students often meet in small groups and are required to be active observers during their communicative process. Group tasks include the development of problem-solving, decision making, critical thinking, and diversity skills. Students learn how to be effective members of small groups in various situations in and outside of class. The course is designed to give students diverse perspectives on small group processes. Topics covered in the course include leadership, the effect of culture on small group communication, diversity, managing conflict, group discussion and observation, and small group processes. Since this course is group oriented, I spend a great deal of time using interactive activities so that students will get to know each other better. I often break students up into teams and have them practice problem solving, listening, ethics, and decision making. The overall goal of the course is to provide students with the needed concepts, theories, and skills to be effective communicators in a variety of small group settings. 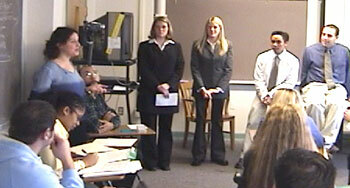 Students apply the class readings, service-learning experience, and various assignments to many real life situations. After achieving this goal, students will have the communicative ability to work in diverse small groups and to apply the professionalism required. Acquire skills that contribute to successful small group participation and satisfaction. Improve critical thinking, problem-solving, diversity skills, and decision-making skills in small groups in class and out of class. Develop an understanding of current research, theories, service-learning, and principles of small group processes to provide the basis of effective application. Be able to adapt to diverse group settings. 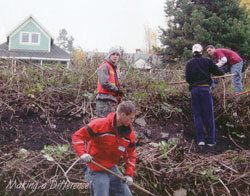 Gain direct hands-on experience by working in small groups with citizens of the community. Student groups are required to collaborate with the service-learning agency by providing service to citizens the agency serves. They take the in-class theories and apply them to their direct community-based service project. As students go out into the community, they work as a team to implement these small group communication skills. Develop a growing partnership with the community agency and citizens the agency serves. Gain hands-on experience with the community and gain knowledge of diversity. Gather background information on the agency mission, vision, and structural chart. Identify communication styles, leadership, conflict management, and group formation. Provide clear communication between yourself, community partner, and the professor. The projects vary from group to group. Often students are asked to provide a direct service to the agency. Examples are: planting trees, assisting the elderly, designing a low ropes course, taking part in Make a Difference Day, winterizing a home for people with AIDS, etc. Teams are asked to serve a minimum of 12 hours. Online Materials. In order to post course content and announcements, I use Blackboard course management software, which is available for instructors at our university. It allows me to communicate with my students regularly, post service-learning teams/dates, and provides previews of upcoming classes. All course assignments, information, and materials are provided on this site for students to view and print at their leisure. This allows students to decide on material to print or just read from the site. In the future, I hope to use other web-based components, such as a discussion board. This will allow students to continue discussion of course material and community based learning outside of class time. I will pose questions as well as have students pose questions to be answered by other class members. The discussion board will be another interactive method for teaching. Visual Presentations. Technology has been widely used throughout higher education to enhance student learning. Given this growth and the importance of this emphasis for my students� futures, I would like to re-envision the oral presentations as visual presentations. Students will be required to bring video and audio clips from their service-learning experience and show them to the class. This will allow audience members to better see and experience what others have been doing throughout the quarter. Students can check out equipment from media services on campus to develop their mediated presentations. They can use laptops for PowerPoint, digital video camcorders to show movies, cameras for still pictures, editing, and much more. As usual, community members will be welcome to attend the final session and also invited to share their experiences working with WWU students. Poster Session Presentation of Class Project. In place of a 25-minute group presentation, students could present their projects in a poster session format. This would allow members of each group to visually display their work from the entire quarter such as: reflections of what they learned, pictures, research paper, videos, etc. All groups would have a poster session and would be required to visit all sessions within a two-hour time frame. After viewing, I would facilitate a collaborative discussion as to what people learned overall. Again, community members would be welcome to attend the final session and share their experiences working with WWU students. Service-learning is a key teaching strategy that professors in all fields can use. It is an excellent tool because it enables students to have first-hand experiences with authentic applications of their learning. It allows the student and professor to actively move from theory to application and then develop new theories. Based on the specific course, professors can create or develop a community-based focus that will allow students to more effectively understand the material. It should not be taught as an extra project or "add-on" to the course. It must be fully integrated into the course curriculum allowing students to reflect daily on their experience. Keep in mind that projects need to be unique to the course. This method can be used in large and small classes. The key to success is to have continuous reflection, discuss how the material applies, and have open lines of communication between students, community, professor, and the service-learning center. Service-learning does take time to develop but the rewards are limitless. The biggest reward is hearing students discuss what they learned and how it connects to their lives in and out of the classroom. Service-learning provides students with communication skills, professional work experience, civic responsibility, diversity, and a chance to build contacts throughout life. Service-learning can only work if the professor is enthusiastic and truly dedicated to integrating this unique nontraditional teaching pedagogy.